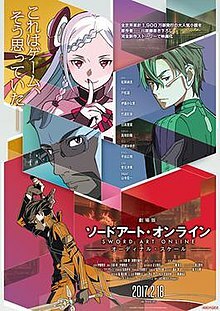 Sword Art Online The Movie: Ordinal Scale (Japanese: 劇場版 ソードアート・オンライン -オーディナル・スケール-, Hepburn: Gekijō-ban Sōdo Āto Onrain -Ōdinaru Sukēru-) is a 2017 Japanese animated science fantasy action adventure film based on the Sword Art Online light novel series written by Reki Kawahara and illustrated by abec. The film is produced by A-1 Pictures and directed by Tomohiko Itō, featuring an original story by Kawahara, character designs by Shingo Adachi and music by Yuki Kajiura. It was released in Japan, Southeast Asia, and Germany on February 18, 2017, in Mexico on March 4, 2017, and in the United States on March 9, 2017. The events of the film take place between the second and third seasons of the Sword Art Online anime series. In the year 2026, the Augma is released to the public as an alternative system to the AmuSphere, due to its function to simulate reality while the player is conscious rather than using FullDive. The most prominent combat-based game is Ordinal Scale, in which a player's abilities are ranked by ordinal numbers. As a horde of Aincrad bosses raid the arena, Kirito and Yuna join the battle. Yuna tells Kirito that the Augma has a hidden full-dive feature and he can use it to defeat SAO's 100th floor boss to end the battle. Before diving, Kirito gives Asuna an engagement ring. Entering the Ruby Palace of Floor 100, Kirito, Lisbeth, Silica, Agil, and Sinon confront the boss. They are easily defeated until Asuna, Leafa, Klein, and several others from ALO and GGO come to their aid. Yui restores their saved abilities from SAO, allowing everyone to defeat the boss. The voice of Akihiko Kayaba congratulates them on their victory and gives Kirito an extremely powerful sword as a reward. At the Dengeki Bunko Autumn Festival 2015 on October 4, 2015, it was announced that the light novel series would be adapted into an animated film, with the main staff returning from the anime series. The film takes place after the anime series' second season, Sword Art Online II. It was then revealed at the Dengeki Bunko Haru no Saiten 2016 event on March 13, 2016 that the film is titled Sword Art Online The Movie: Ordinal Scale. The voice cast from the anime series returned to reprise their roles in the film. The film's soundtrack is composed by Yuki Kajiura, who also composed the music for the anime series. The soundtrack features 50 tracks, including 5 insert songs performed by Sayaka Kanda. It was released by Aniplex on February 22, 2017. LiSA performed the film's theme song, titled "Catch the Moment". Sayaka Kanda performs five songs as Yuna: "Ubiquitous dB", "Longing", "Delete", "Break Beat Bark!" and "Smile For You". The film premiered in Japan, Southeast Asia and Germany on February 18, 2017. The Asian premieres were distributed by Aniplex and Odex, respectively. There was a premiere event in the United States on March 1, 2017; Eleven Arts distributed and released the film in U.S. theaters on March 9, 2017. Madman Entertainment also released the film at theaters in Australia and New Zealand on March 9, 2017. Aniplex of America released the film at theaters in Canada between March 17 and March 19, 2017. The English dub premiered at Anime Boston 2017, with a national release on April 22. Anime Limited brought the film to cinemas in the United Kingdom and Ireland on April 19, 2017. The film was set to play in about 1,000 theaters worldwide. A few days after the world premiere, a leak of the film was found online, tracing the source back to Malaysia and Singapore. The Blu-ray and DVD home video release volumes of Sword Art Online The Movie: Ordinal Scale were released in Japan on September 27, 2017 and North America on December 19, 2017. The Japanese home video release features a sequel novel titled Sword Art Online: Cordial Code written by Kawahara and illustrated by abec, set eight days after the events of Ordinal Scale. The film on its opening weekend opened at No. 1 at the Japanese box office, debuting in 151 theaters across Japan and grossed ¥425 million from 308,376 admissions. It went on to gross a total of ¥2.52 billion ($22,682,268) in Japan by the end of 2017. In China, the film has grossed CN¥53.95 million. It grossed over $1.35 million in its first weekend in North America, and went on to gross $1,522,976 in the United States and Canada. During its first day in Italy, the film beat out both Pirates of the Caribbean: Dead Men Tell No Tales and Wonder Woman at the box office. By October 1, 2017, the film had grossed a total of over ¥4.3 billion ($38.2 million) worldwide. After October 5, 2017, the film grossed a further $41,652 in China, and $14,702 in Argentina, for a worldwide total of $38,256,354. Alex Osborn of IGN posted a score of 7.5/10 and stated: "It's not a visual stunner, but Ordinal Scale serves up a solid original story that will help tide over those who are hungry for more SAO while they wait for a third season". A review coming from Cine Premier's Julio Vélez who scored it a 4/5 and stated: "The second act falls a little in action by focusing more on defining the motives of the antagonists, but everything recovers in an exciting and prolonged climax". In a review featured on the anime streaming website Crunchyroll, Isaac Akers states "SAO being SAO, this was never going to be a perfectly crafted movie—but it captures so many of the charms of the franchise whilst also avoiding nearly all of its most aggravating faults." ^ 劇場版　ソードアート・オンライン　―オーディナル･スケール― (2017). allcinema (in Japanese). Stingray. Retrieved February 10, 2017. ^ a b "Sword Art Online: Ordinal Scale Film Earns 4.3 Billion Yen Worldwide". Anime News Network. October 1, 2017. Retrieved October 1, 2017. "Sword Art Online the Movie: Ordinal Scale Film Unveils New Cast, Visual". Anime News Network. March 28, 2016. Retrieved March 28, 2016. Green, Scott (July 3, 2016). ""Sword Art Online" Movie Visual And Promo Published". Crunchyroll. Retrieved July 3, 2016. "Sword Art Online Ordinal Scale Anime Film Casts Sayaka Kanda". Anime News Network. December 6, 2016. Retrieved December 6, 2016. ^ "Sword Art Online: Ordinal Scale English Dub Screenings Begin April 22 in U.S." Anime News Network. March 14, 2017. Retrieved March 14, 2017. ^ "Sword Art Online Anime Film Project Revealed". Anime News Network. October 4, 2015. Retrieved March 27, 2016. ^ Chapman, Paul (October 4, 2015). "VIDEO: "Sword Art Online" Movie Announced with Teaser Trailer". Crunchyroll. Retrieved March 27, 2016. ^ "Sword Art Online Film Takes Place After Mother's Rosario Arc". Anime News Network. October 31, 2015. Retrieved March 27, 2016. ^ "Sword Art Online Ordinal Scale Film to Open in 2017 (Updated)". Anime News Network. March 13, 2016. Retrieved March 27, 2016. ^ "Aniplex USA Streams Sword Art Online the Movie: Ordinal Scale's English Trailer". Anime News Network. March 13, 2016. Retrieved March 27, 2016. ^ Green, Scott (March 13, 2016). "English "Sword Art Online The Movie -Ordinal Scale-" Trailer Presented". Crunchyroll. Retrieved March 27, 2016. ^ "Sword Art Online the Movie's 3rd Teaser Introduces Cast, Previews LiSA's Theme Song". Anime News Network. December 24, 2016. Retrieved December 25, 2016. ^ "LiSA Performs Theme Song For Sword Art Online Ordinal Scale Film". Anime News Network. November 27, 2016. Retrieved November 27, 2016. ^ "Sword Art Online Movie's New Trailer Reveals Spring 2017 Opening". Anime News Network. July 3, 2016. Retrieved July 3, 2016. ^ "Sword Art Online Movie's February 18 Date Confirmed in Japan". Anime News Network. October 2, 2016. Retrieved October 2, 2016. ^ "Sword Art Online the Movie: Ordinal Scale Opens in Southeast Asia on February 18". Anime News Network. December 13, 2016. Retrieved December 13, 2016. ^ "Sword Art Online Ordinal Scale Film Opens in U.S. on March 9". Anime News Network. December 6, 2016. Retrieved December 6, 2016. ^ Browne, Tessa (December 20, 2016). "Sword Art Online: Ordinal Scale Australian premiere set for Madman Anime Festival Perth in March!". Madman Entertainment. Retrieved December 20, 2016. ^ "Sword Art Online: Ordinal Scale Film's Canadian Screenings Begin on March 17". Anime News Network. February 10, 2017. Retrieved February 11, 2017. ^ "Aniplex of America Presents: SAO The Movie -Ordinal Scale- Eng Dub Premiere!". Anime Boston. March 10, 2017. Retrieved March 10, 2017. ^ "Aniplex USA". Facebook. March 10, 2017. Retrieved March 10, 2017. ^ "Newswire #98 - 19th Jan 2017 - All the Anime". Anime Limited. January 20, 2017. Retrieved January 27, 2017. ^ "Anime Limited and Funimation Updates". Anime News Network. February 19, 2017. Retrieved February 19, 2017. ^ "Sword Art Online Film to Play in About 1,000 Theaters Worldwide". Anime News Network. Retrieved February 12, 2017. ^ "ODEX Copyright Notice". Odex. February 23, 2017. Retrieved February 23, 2017. ^ "Odex Receives 'Notice From Japan' About Sword Art Online Film Leaks in Singapore, Malaysia". Anime News Network. February 24, 2017. Retrieved February 25, 2017. ^ Green, Scott (August 12, 2017). "Aniplex Of America Outlines Plans For "Anohana," "Monogatari" And "Sword Art Online" Blu-rays". Crunchyroll. Retrieved August 12, 2017. ^ Komatsu, Mikikazu (August 4, 2017). ""Sword Art Online The Movie: Ordinal Scale" DVD/Blu-ray Comes with Sequel Novel". Crunchyroll. Retrieved August 9, 2017. ^ "Sword Art Online: Ordinal Scale Film Tops Japanese Weekend Box Office". Anime News Network. February 20, 2017. Retrieved February 20, 2017. ^ "Sword Art Online: Ordinal Scale Film Sells 308,376 Tickets for 426 Million Yen at #1". Anime News Network. February 20, 2017. Retrieved February 21, 2017. ^ "2017". Eiren. Motion Picture Producers Association of Japan. Retrieved March 9, 2019. ^ "刀剑神域：序列之争（2017）". Maoyan (in Chinese). Retrieved March 9, 2019. ^ "Sword Art Online Film Earns Over US$1.35 Million After 1st N. American Weekend". Anime News Network. March 18, 2017. Retrieved March 18, 2017. ^ "Sword Art Online: The Movie - Ordinal Scale (2017)". Box Office Mojo. Retrieved 9 March 2019. ^ ""Sword Art Online - Ordinal Scale" Beats "Pirates of the the[sic] Caribbean" In Italian Box Office". Crunchyroll. June 14, 2017. Retrieved June 21, 2017. ^ "China Box Office, October 6–8, 2017". Box Office Mojo. Retrieved 9 March 2019. ^ "Argentina Box Office, May 3–6, 2018". Box Office Mojo. Retrieved 9 March 2019. ^ "Sword Art Online The Movie: Ordinal Scale" (in Spanish). Cine Premiere. Retrieved December 26, 2017. ^ "Sword Art Online The Movie: Ordinal Scale". Rotten Tomatoes. Retrieved June 1, 2017. ^ "FEATURE: "Sword Art Online: Ordinal Scale" Review". Crunchyroll. Retrieved March 20, 2017. This page was last edited on 25 April 2019, at 12:54 (UTC).